In recent years, many disciplines have become interested in the scientific study of morality. However, a conceptual framework for this work is still lacking. 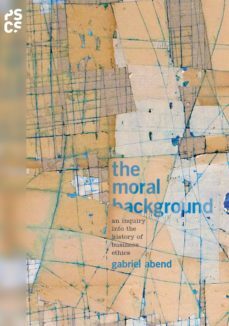 In The Moral Background, Gabriel Abend develops just such a framework and uses it to investigate the history of business ethics in the United States from the 1850s to the 1930s. According to Abend, morality consists of three levels: moral and immoral behavior, or the behavioral level; moral understandings and norms, or the normative level; and the moral background, which includes what moral concepts exist in a society, what moral methods can be used, what reasons can be given, and what objects can be morally evaluated at all. This background underlies the behavioral and normative levels; it supports, facilitates, and enables them. Through this perspective, Abend historically examines the work of numerous business ethicists and organizations—such as Protestant ministers, business associations, and business schools—and identifies two types of moral background. "Standards of Practice" is characterized by its scientific worldview, moral relativism, and emphasis on individuals actions and decisions. The "Christian Merchant" type is characterized by its Christian worldview, moral objectivism, and conception of a persons life as a unity. The Moral Background offers both an original account of the history of business ethics and a novel framework for understanding and investigating morality in general.